In the short term, yesterday’s OPEC meeting does not preclude further near term strength in oil prices. The deal was broadly in line with analysts’ expectations (and hence largely priced in). Oil prices, though, are in a clear uptrend. Both the 50 and 200 day moving averages are trending higher (FIG 1 & 1a), momentum investors are in control, most equity investors in energy expect further near term upside and short term market timing models confirm that there is room for that further upside. That, though, is simply a near term 1 – 3 week view. 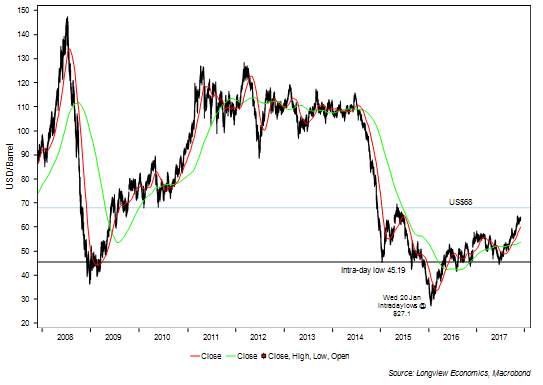 Looking beyond that, on a multi month (1 – 6 month) view, there’s a growing case that oil will struggle to break through US$68 (BRENT) and US$61-$62 (WTI). Those levels are key resistance levels for oil, representing the highs from the bounce in early 2015 (after the 2014 sell-off) as well as a congestion area in 2009 (see FIGs 1 & 1a). Added to that, a bounce to around that level would likely generate a full set of SELL signals on our medium term models. Already our market timing model for oil (which aggregates a variety of factors) is on SELL (and close to strong SELL – FIG 2). 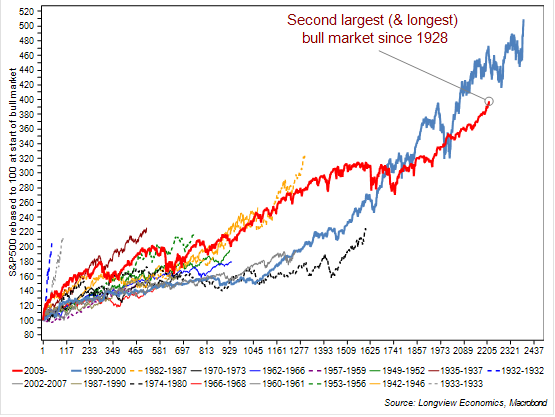 Looking back over time, a significant majority of those SELL signals have been effective on a multi month time frame. Other medium term models (e.g. 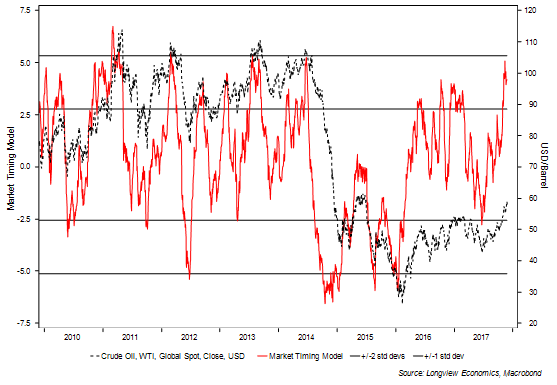 Consensus sentiment, medium term technical model for BRENT), whilst close to SELL are not yet at those levels. Net speculative positioning is also high. As laid out HERE, we recommend starting to move SHORT OIL futures (on a multi month timeframe) if that rally up towards key resistance levels is forthcoming. 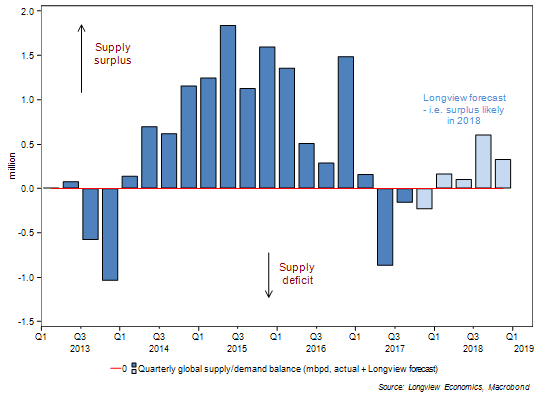 …which is one of the key reasons why we are forecasting a global supply surplus that year (FIG 4). For full analysis of the fundamentals please see HERE. An Electric Vehicle Revolution – How credible is it? It’s readily and widely accepted that, at some stage, oil will no longer be the world’s primary energy source. A decade ago, ‘peak oil supply’ was expected to deliver that change. Now, with the take up of electric vehicles (EVs), ‘peak oil demand’ is the key long term threat to the world’s oil market. That ‘peak demand’ expectation fits the pattern of history. Indeed, as the quote above alludes to, changes in the main energy source are usually demand driven. (i.e. over the course of just 50 years). By 1970 (i.e. 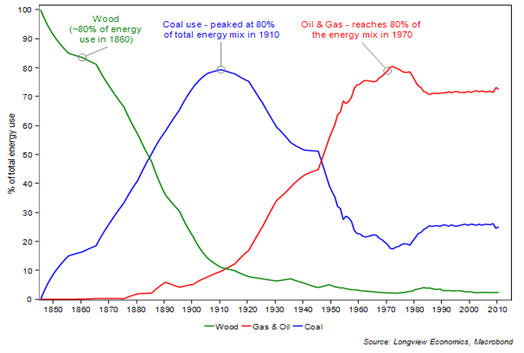 60 years later), it had changed again (from coal to oil & gas), see FIG 5. Fast forward another 50 years, and another structural shift in the energy mix is underway – i.e. away from oil and coal and towards gas. 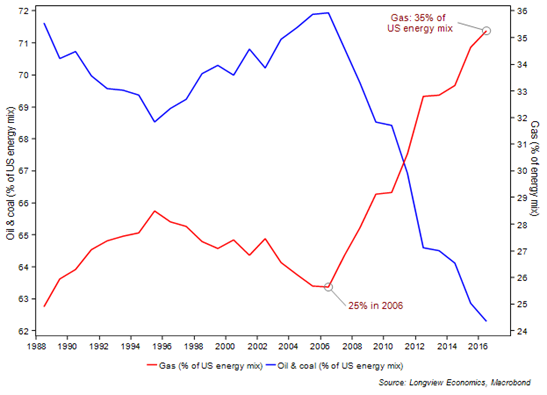 Natural gas now accounts for 35% of US energy (up from 25% a decade ago). The combined share of coal and oil has fallen by a similar magnitude (mostly reflecting a move away from coal). The nub of the (long term) oil market debate, though, as always in markets, is timing. 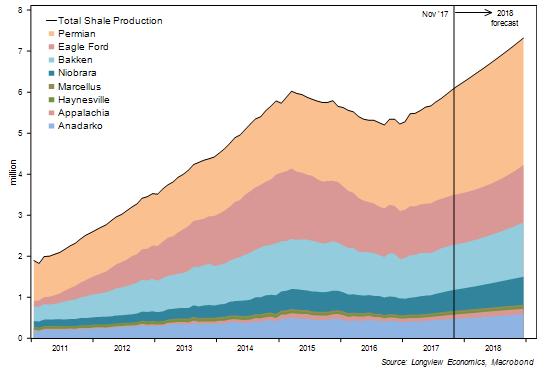 In particular, over what time frame can we expect a significant and rapid take up of electric vehicles (which would accelerate the recent shift away from oil – see chart above) and towards renewables (and probably towards more gas)? Our analysis suggests that, if auto maker targets are reached, then the penetration of EVs into the global passenger car fleet will be ~50% by 2040. In other words, half of the 2 billion passenger cars on the roads by 2040 will be electric. Instinctively, that seems unrealistic – perhaps because it’s a significant, rapid, non-linear step change (i.e. the type of significant change which is usually outside of consensus thinking). Indeed, for that forecast to be correct, the world’s current vehicle fleet of EV cars (currently only 2 million) would need to grow by 30% p.a. (on average) to reach 1 billion by 2040. The context of rapid changes in the energy mix (as noted above) is therefore instructive. It’s also worth noting, as we highlighted in early November (see HERE), that the sales trajectory of EV cars is already rapid (and currently growing at around 70% p.a.). With that, auto makers are channelling their R&D/capex budgets into developing a comprehensive EV offering (and maintain relatively high growth rates). By 2019, for example, all new Volvo cars will be electric. By 2020, all new Jaguar-Land Rover models will be electric. By 2020, 40% of Ford’s models will be electric. 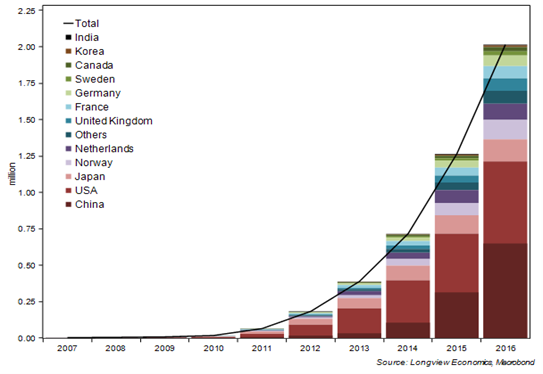 Rapid growth in the world’s EV fleet (FIG 5c) is therefore likely to continue and, with that, if auto makers deliver on their promises, consumer choice will become increasingly restricted/re-orientated towards the EV product range. 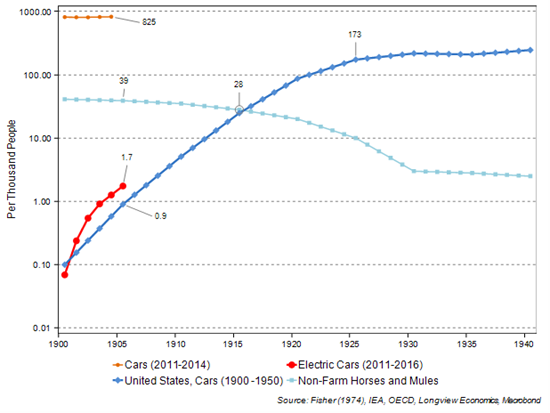 A recent study by the IMF is interesting in that respect – showing that the take up of EVs in the past 5 years is not dissimilar to the take up of motor vehicles in the early 1900s. In fact, take up of EVs (per person) is happening more quickly (see FIG 5b below – NB log scale). On the current trajectory, therefore, traditional combustion engine motor vehicles, like horses & mules in the early 20th century, are poised to become a footnote in the history of mass transportation. Long term global oil demand growth is likely, therefore, to be significantly impacted by these changes (i.e. over the course of the next several decades). Historically, global demand has grown at around 1.5%. Under our scenarios, that growth rate is likely to slow (to probably sub 1% by the middle of the next decade – see HERE for detail). For a full list of Longview publications over the past fortnight, please see below (NB excluding the Daily RAG). "Gold - Disaggregating the Drivers a.k.a. Why it's going down"
"Oil Positioning - Close to Multi-Year Highs"
Notice: This email is intended for the named recipient only. It may contain privileged and confidential information. If you are not the intended recipient, notify the sender and destroy this email. You must not copy, distribute or take action in reliance upon it. Whilst all efforts have been made to safeguard emails, Longview Economics cannot guarantee that attachments are virus free or compatible with your systems and does not accept liability in respect of viruses or computer problems experienced. Longview Economics reserves the right to monitor all emails. No legally binding commitments will be created by this e-mail message. Where we intend to create legally binding commitments these will be made through hard copy correspondence or documents. Longview Economics Ltd. is an appointed representative of Messels Limited. Messels Limited is authorised and regulated by the Financial Conduct Authority.